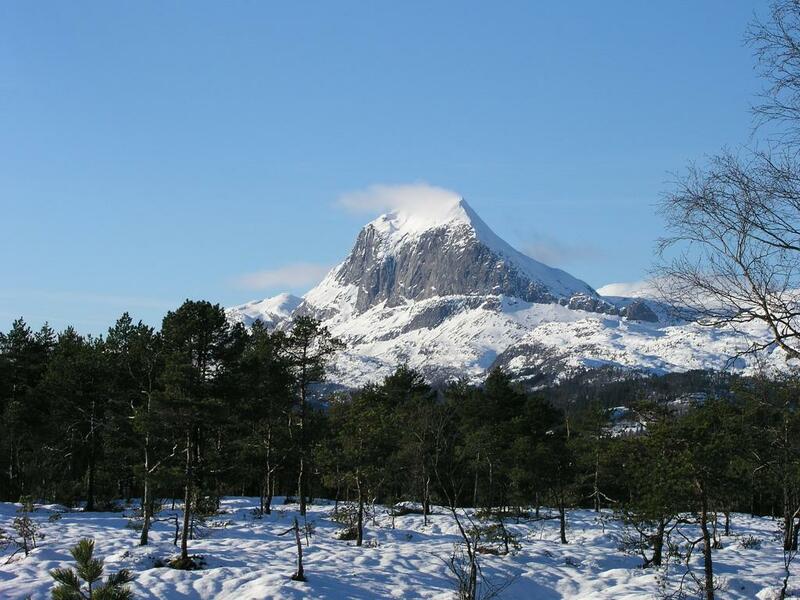 Location: Near Bygstad, SW of the town Førde, Sogn og Fjordane, Norway. 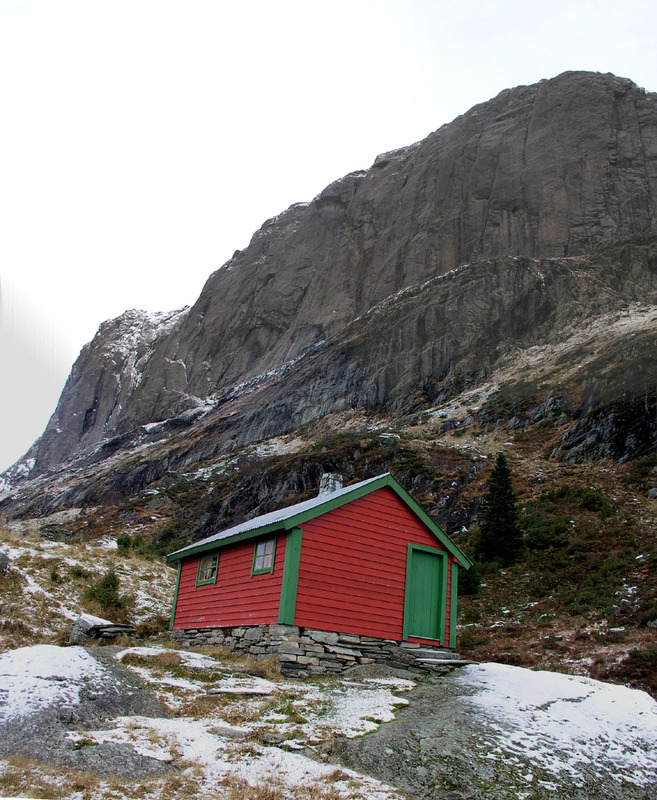 How to get there: The best place to start is the small farm community Bygstad. 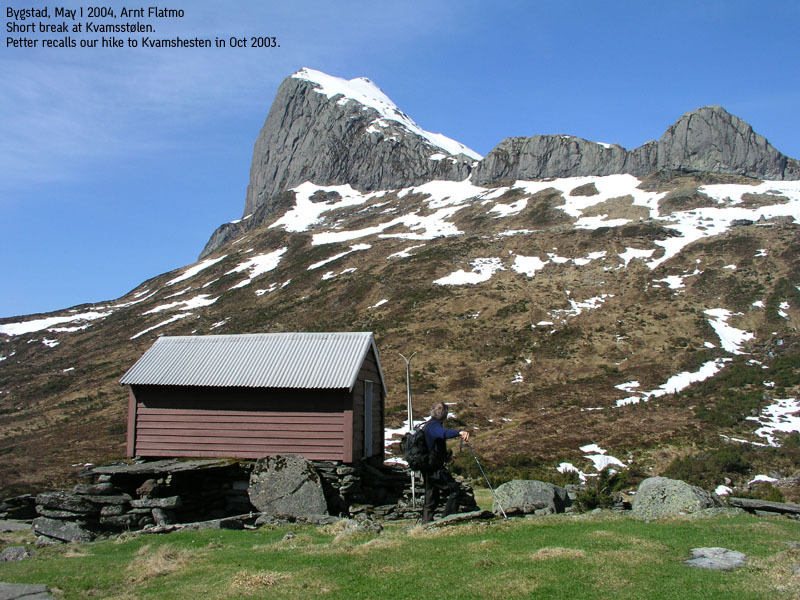 From the south, drive 15 km north from Vadheim (about 3 hours from Bergen) along E-39 towards Førde. Make a left on Hwy. 610 in Sande and continue 10 km to an intersection called Osen. Make a sharp right here across a bridge and continue on a smaller road. The road narrows and takes you along the inner part of Dalsfjorden shortly before Bygstad where the road forks. From the north, you must drive about 13 km south along E-39 from Førde then 12 km to the right along Hwy. 57 in order to reach this intersection. Continue west along the fjord, the sign says Laukeland. Soon, the road heads inland towards the very impressive face of Kvamshesten, continue until a sharp left bend on the road just as it crosses the creek. Do not cross the creek, but take the road that goes right. This is the second (main) road forking right after leaving the fjord. Drive this road uphill and make a sharp right where this road crosses creek number two. This is private land (the Rytnane farm) and you should ask permission to park and follow the advice given, we parked at GPS location N61:23.401, E005:37.306, elevation 200 meter. An alternative, and possibly better trailhead is described under the mountain Blægja. 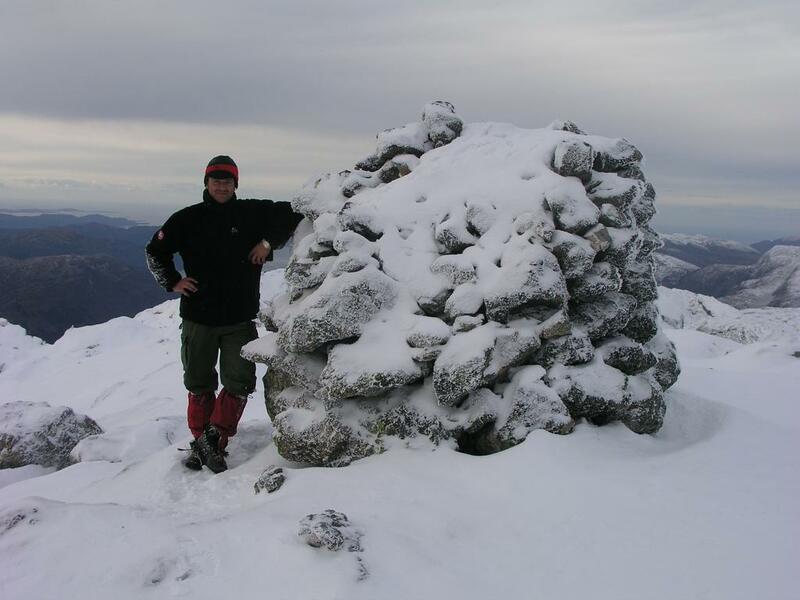 Route description: Start hiking along the private road that continues uphill towards the NE. As soon as this road (not indicated on the map) levels off near the 400 meter elevation, head straight left towards the mountain. There is a section of dense forest, hike west if necessary until you locate an old trail that will lead you through the trees as it angles upward to the small farm cabin Rabbane (see picture below). From here, the trail continues uphill and to the right, whenever possible, take the highest possible trail and head for the very characteristic cliff that marks the east end of the continuous cliffs above you (see picture below). There is a small creek (from Skardavatnet, 715m) that comes down here, there is a steep, but good trail going up on the east (right) side of this creek. 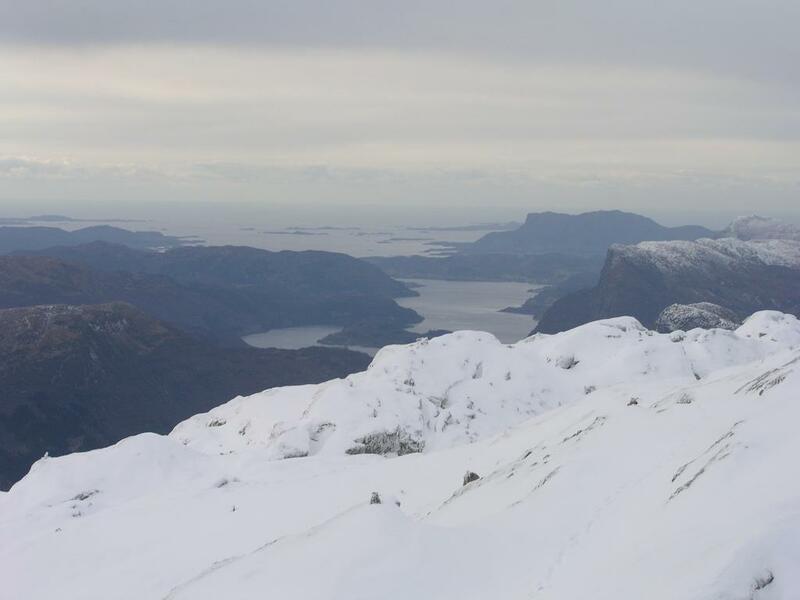 From Skardavatnet, there is a (fairly steep) route directly to the summit along the east ridge of Kvamshesten. However, due to the late October conditions with thin ice covering many rocks, we hiked a somewhat longer, but easier route that comes up along the west ridge. 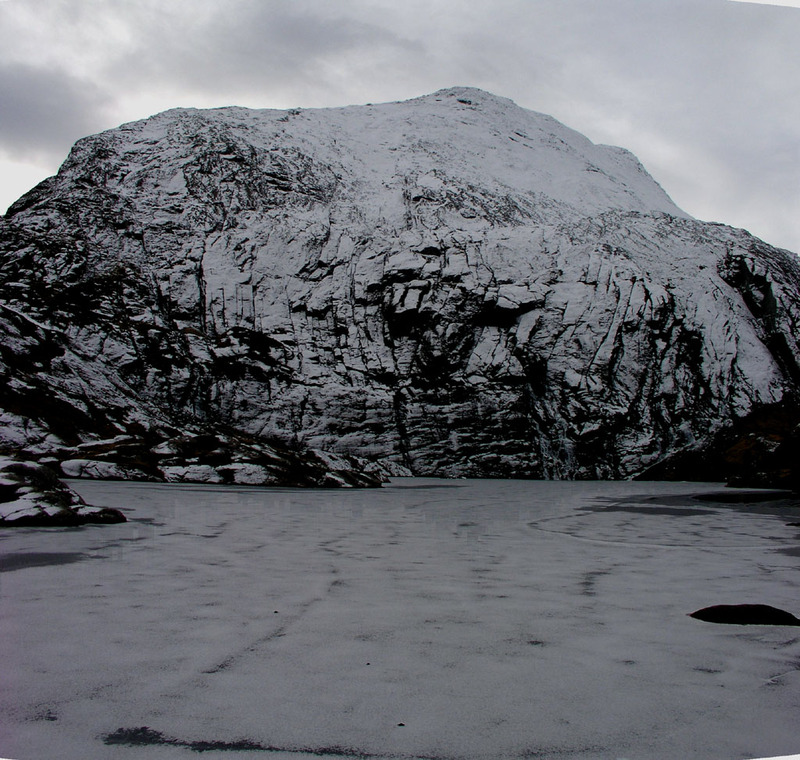 In order to follow this route, hike north of the mountain to Grunnevatnet (785m), continue west on the north side of this lake following the ridge, gradually turning south and aim for point 1114m, a shoulder on the Kvamshesten west ridge. 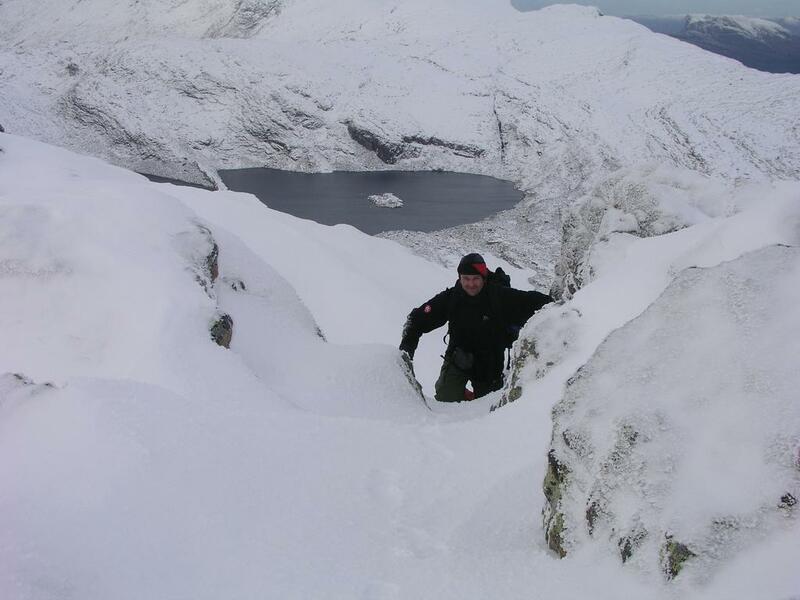 From here, continue up a distinct gully, the route is marked with cairns. Higher up, the cairned route seemed to contour a bit on the south side of the ridge, however, due to rather icy conditions, we found it easier and safer to head directly up along good ledges and regain the top of the west ridge. The last section to the summit point is then straightforward. Comments: I did this hike with Arnt Flatmo. We started at 0945, made the summit in a little less than 4 hours. After about 15 minutes on the summit enjoying the fantastic 360 degrees views, we descended a somewhat shorter route in about 2 hours. 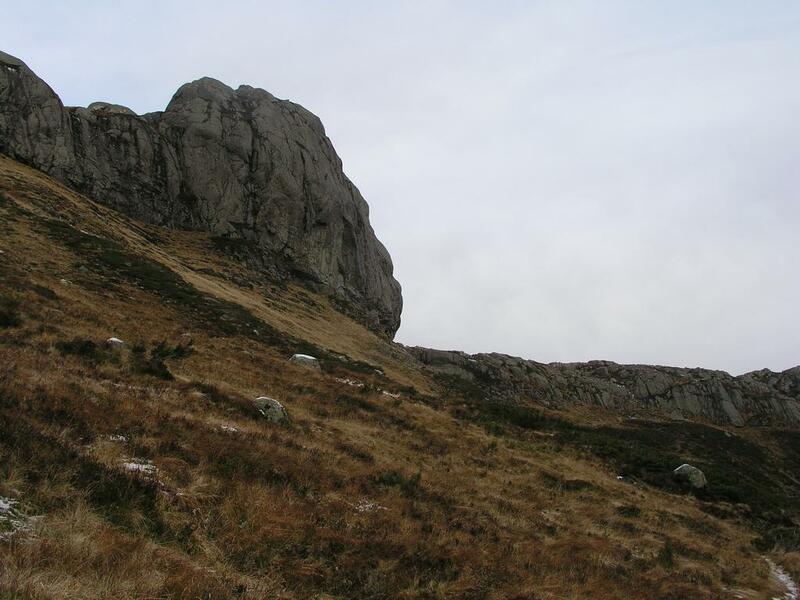 Including the roundtrip travel from Bergen, the trip took 13 hours, a very nice late October hike. Kvamshesten as seen from Hwy. 39 south of Førde, February 15. 2004. Kvamshesten towering above the first section of the route. Rabbane, a small cabin under a huge cliff. The charcteristic cliff, where the trail heads up next to a creek. Lake Grunnevatnet, 785m, the route proceeds on the right side as it climbs the ridge to point 1114m up left, the summit is outside the picture. The last few steps to the Kvamshesten summit. 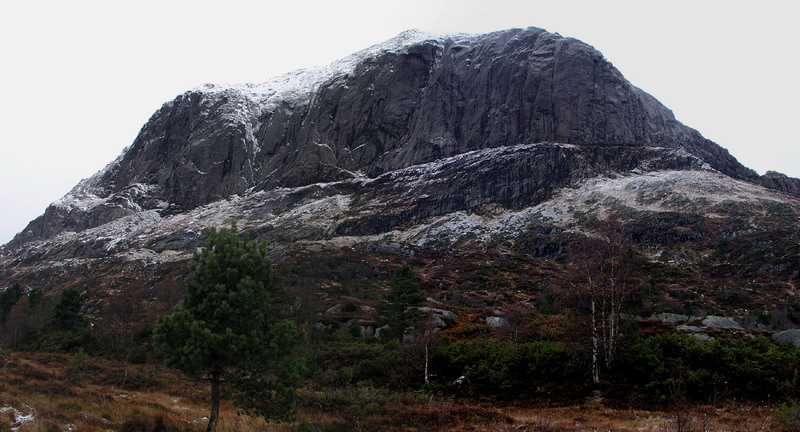 Panorama view, from NE to SW, from left to right, Litlehesten, 912m, the East ridge of Kvamshesten, the farms at Bygstad. The "lakes" directly below is actually the inner part of Dalsfjorden. Ocean view, to the west. The ridge to Blægja, actually Hellefjellet, 1231m, in the middle, Selsvatnet, 840m, in the foreground, Blægja is to the far left. Skardavatnet, 715m, with Kvamshesten behind. Kvamshesten similar to the previous picture, but May 1.